The decision between choosing carpeting or hard flooring in schools has a direct impact on your classroom indoor air quality. Moisture can become trapped under hard surface flooring. Once moisture is trapped and unable to evaporate, the moisture can turn into mold and mildew. A better option is seamed carpet tiles that allow the moisture to escape or allows ‘moisture wicking’, which significantly reduces mold and mildew from occurring. Allergens are another significant contributor to air quality problems. All manner of animal and plant allergens are tracked into schools on a daily basis, and in rooms with hard surface flooring, these allergens are left floating around in the breathing zone. Daily cleaning does little to alleviate this problem, with sweeping and mopping often serving to spread allergens further around the room. In contrast, carpet can trap these allergens, and keep them out of the breathing zone. Once trapped, allergens can be removed using a vacuum with a HEPA filter. 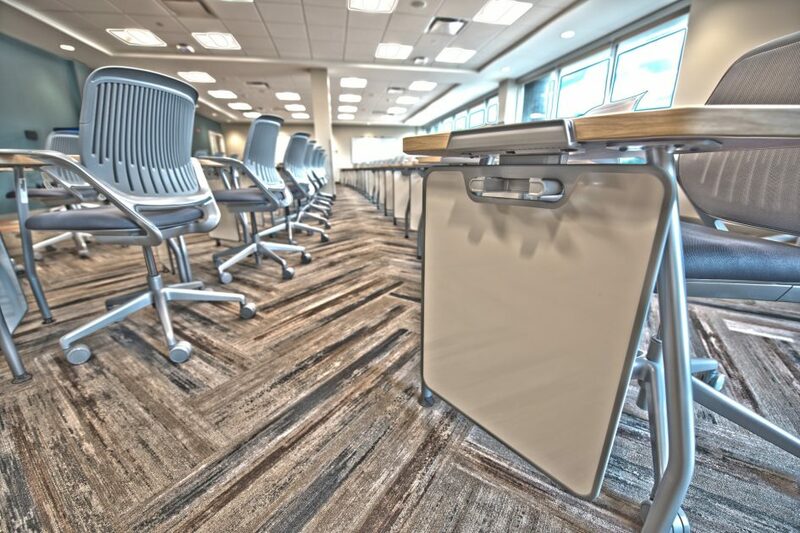 By using a dry powder cleaning technique, along with vacuuming – using porous micro-beads to absorb allergens, dust mites, liquids, and dirt – carpet becomes a best-in-class flooring option with regards to Indoor Air Quality. In general, studies show that the breathing zone over a hard surfaced floor can contain almost 9 times more breathable particulates than the air over a carpeted floor.